On Tuesday, April 30, 2013 an era ended. After 33 years on the throne, her Majesty Queen Beatrix of the Netherlands stepped down in favor of her son, Crown Prince Willem Alexander. 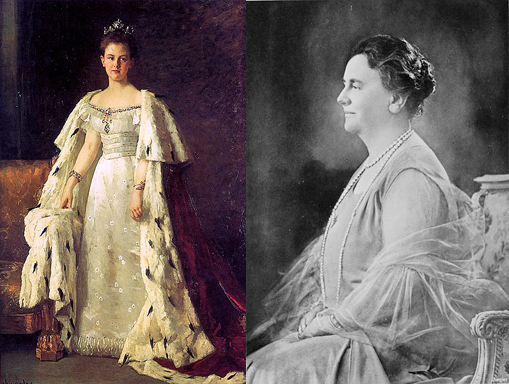 It was the end of her reign, and it also marked the end of 123 years of women at the helm of the Netherlands. In 1890 Queen Wilhelmina (1880-1962) inherited the throne of the Netherlands upon the death of her father, King William III. Being as she was only 10 at the time of her enthronement, her mother Queen Emma served as Queen Regent until 1898. In 1901 Queen Wilhelmina married Hendrik of Mecklenburg-Schwerin, who is remembered (at least in my family) for his unfortunate, if entertaining, malapropisms (including famously asking a monk if his father had also been of the monastic profession, and then realizing there was something amiss about that question correcting himself and saying, ‘oh, but monk’s don’t have fathers’). In 1909, after a tense eight years and fears that the crown might pass into the hands of the German Imperial family (gasp! ), Crown Princess Juliana was born. Queen Wilhelmina saw her country through two world wars – fleeing to exile in England following the German invasion of the Netherlands in 1940 where she was a beacon of resistance for the Dutch people during the Nazi occupation – the great depression, and the dissolution of the Dutch empire in the East Indies. She also managed, through shrewd financial management, to become one of the wealthiest women in the world, proving that she was smart as well as charismatic. In 1948, after nearly 60 years on the throne, and in failing health, she passed the crown to her daughter. 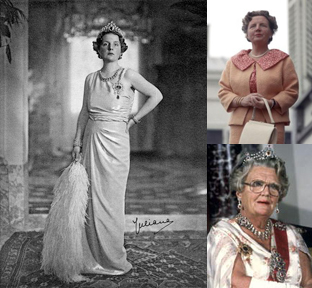 Queen Juliana (1909-2004) came to the throne in 1948 following her mother’s abdication. She married Bernhard of Lippe-Biesterfeld in 1937. It was a love match which endured throughout their marriage, despite their separation during WWII, his philandering and several illegitimate children (although apparently he was exceedingly charming, and very popular, which I suppose you’d need to be if you’re going to cheat on both your wife and monarch). 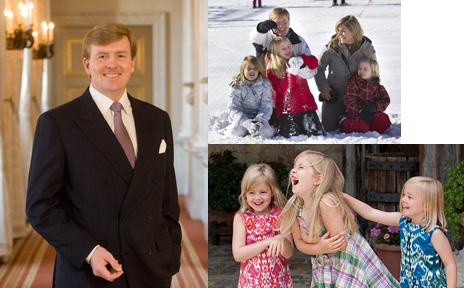 They had four children – all girls – Beatrix, Irene (more on her later), Margriet, and Christina. In 1940 Princess Juliana fled to England with the rest of the royal family. Her mother and husband remained in England, while she took the royal children to safety in Canada. She returned to the Netherlands and was reunited with her family in 1945 where she worked closely with the Red Cross providing relief and reconstruction for the war battered country. In 1953 the Netherlands was hit by the worst storm in over 500 years, and the ensuing flooding killed thousands and trapped tens of thousands more. Queen Juliana permanently endeared herself to her people by joining the relief efforts and wading out in boots and an old coat to bring people food and clothing. Later in life she started to suffer from Alzheimers, and in 1980 she abdicated in favor of her eldest daughter Crown Princess Beatrix. 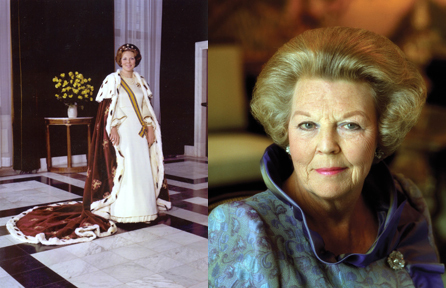 Queen Beatrix (1938-present) came to the throne in 1980 following her mother’s abdication. In 1966 she created a minor scandal (although nothing like her younger sister’s marriage – really more coming later) by marrying Claus von Amsberg who suffered mostly from being German and marrying into the royal family of a country still recovering from the trauma of WWII. She then went on to shock and delight everyone by bucking tradition and having not one, but three sons – Willem-Alexander, Friso, and Constantijn. 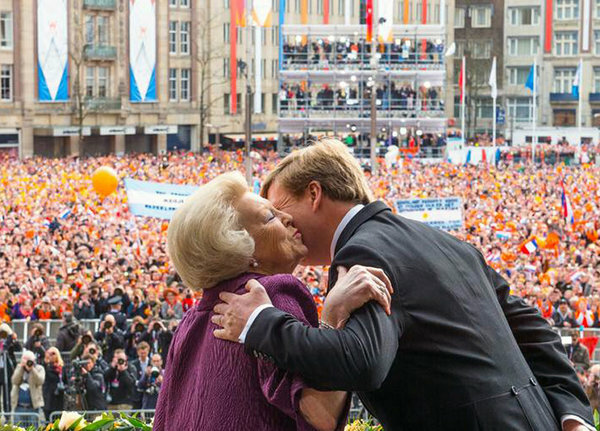 On Tuesday, April 30, 2013, after exactly 33 years on the throne, Queen Beatrix abdicated in favor of her eldest son, Crown Prince Willem-Alexander, saying it was time to, “place the responsibility for the country in the hands of a new generation.” Presumably she then went home, took off her shoes, and prepared to enjoy retirement. King Willem IV (1967-present) acceded to the throne of the Netherlands on April 30, 2013 immediately following his mother’s abdication. In the tradition of the Dutch royal family, he attended Leiden University where he studied water management (which seems highly relevant and useful). He also, apparently, frequently flies the Dutch royal airplane when he and his family travel abroad, which is a fact I find oddly charming. For a while the country was a little dubious about the prospective transition from more than a century of sober Queens to what appeared to a somewhat gad-about royal prince – he was known to enjoying sharing a beer, or two or three, with his subjects. However, following his marriage to Maxima (minor scandal because of her father’s role in the Argentinian military dictatorship – but she won the country over in short order) and birth of his three daughters (he’s not bucking tradition) – Catharina-Amalia, Alexia, and Ariane – he settled down. 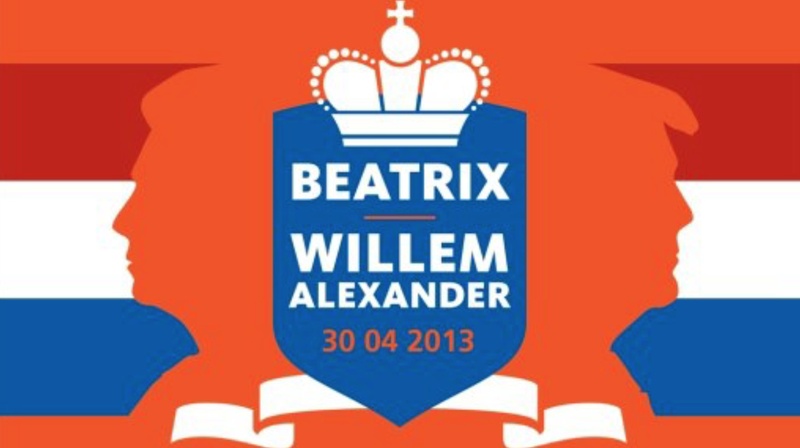 I am entertained by the fact that King Willem IV’s reign will be just a brief blip in the line of Dutch queens. Barring some tragedy (or, I suppose, conversion to Catholicism – which really is another way of saying tragedy in Dutch* (well, not south of the rivers I guess, but they don’t count, they’re practically Belgian), there will be a Queen Catharina-Amalia at some point later this century. In honor of the changing of the guard, this is a Dinner inspired by the food and culture of the Netherlands. If you’d like pictures of the official guests at the pre-Abdication Dinner (the one in the Netherlands) you can peruse some here. No word on what they got to eat, though. And, for pictures of the actual Abdication/Enthronement, you can see some here. * You think I jest, but it happened to her Great-Aunt Irene, who secretly converted to Catholicism, married a pretender to the Spanish throne, and was subsequently removed from the line of succession. Her younger sister Christina also converted to Catholicism upon marriage (and removed herself from the line of succession), but at least she did it openly and with significantly less fanfare. Putting this menu together was somewhat more challenging than I had anticipated. I wanted a meal that was both special and Dutch. Now, when the Dutch go out to dinner they go out for pancakes (not practical for Dinner because I refuse to get stuck in the kitchen while everyone else eats); rijstafel (tasty, but I wanted something organically Dutch rather than something imported from the colonies); or, apparently, French food. It’s not that I blame them in their preference for foreign food (or pancakes), because as my mother said, ‘have you ever seen a Dutch restaurant?’. Dutch food – like much northern European cuisine – tends to run the gamut of boiled and mashed in a variety of combinations and iterations. There are lots of blog posts and recipes floating around on the internet for Dutch sweets, because the Dutch make exceedingly good sweets, often filled with marzipan (which, in my opinion, makes everything better). Finding recipes for non-dessert foods is a little harder, particularly when you throw in the caveat that you want it to be a special occasion dish. My local library system surprisingly coughed up five (5!) Dutch cookbooks. I perused them and discovered that they were predominately filled with recipes for either the aforementioned boiled & mashed meat and potatoes meals, or with elaborate dishes that sounded like they’d be more likely to emerge from a Parisian restaurant kitchen than a Dutch home. In confusion, I turned to my father to ask what they used to eat for holiday meals when he was a boy. I was looking for the Dutch equivalent of the quintessential American Thanksgiving meal, or the storied British Sunday lunch. He considered this and then offered the opinion that when the Dutch want to make a special meal they tend to turn their gazes southward to France or Italy for inspiration. 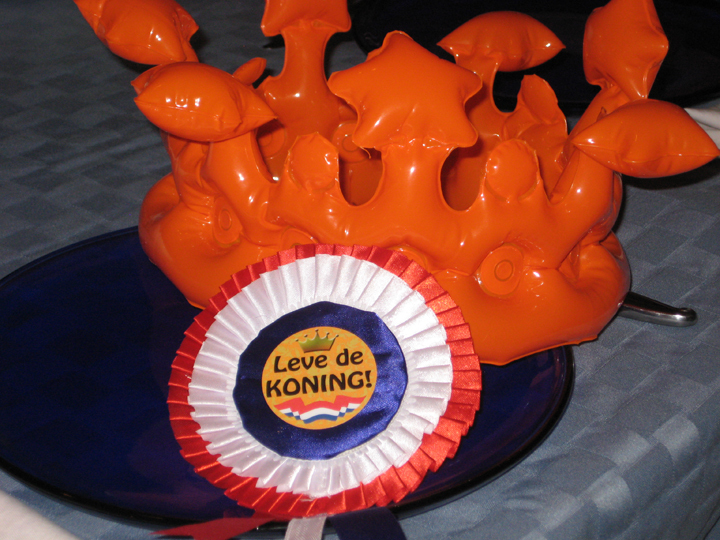 He threw the question to his brothers who confirmed this conclusion, and then kindly sent me recipe suggestions for traditional Dutch recipes, and an awesome awesome bright orange inflatable crown to commemorate the occasion. Eventually I found a few recipes that looked like they’d been inspired by France, but still remained Dutch in character. I passed them by my father who championed the recipe for Hazenpeper, saying that it was the kind of dish that in his childhood would have been served in the nicer restaurants and better homes. I paired with it with an absolutely traditional mashed potato and apple dish, and somewhat non-traditional roasted Brussels sprouts. Dessert was the easy part. I could have gone with any one of the many fantastic Dutch sweets, but early on in my search I had run across a recipe which goes by the highly evocative name of Boerenjongens and Boerenmeisjes (country lads & lasses). The recipe involved simmering raisins and/or dried apricots (one is lads and one is lasses, but I’m unclear as to which is which) in a sugar syrup and then soaking them in brandy for six weeks. You serve them with a drizzle of heavy cream, or over ice cream. You understand why I could not pass up the chance to make this, and I’ve had containers of highly alcoholic fruit marinating in my closet for over a month now. The restraint it has taken to not break in and try them early has been heroic on my part. This is, essentially, a coq au vin but made with rabbit and a lot simpler (well, simpler than Julia Child’s version of coq au vin at any rate). I came across one version of the recipe that thickened the braise with crumbled spice cake, which sounded interesting but wasn’t ultimately the recipe I decided to use. The recipe I did end up using suggested that you could replace the wine with water, which sounded implausibly and unappetizingly frugal. I recommend wine. You can strip this recipe down to just rabbit, wine, vinegar, onions, and pepper, or you can doll it up with the addition of garlic, rosemary, orange zest, and juniper berries (if you had them – I didn’t, but think they’d be an excellent addition if you did). Next time I make this – and I will make it again, because it was very tasty – I’ll skip the hassle and expense of finding rabbit and just use skinless bone-in chicken thighs because once the rabbit has been marinated in wine and covered in creamy sauce it really just tastes like chicken. Combine the red wine, vinegar, pepper, onion, and bay leaves (and rosemary/garlic/orange zest/juniper berries if you’re feeling decadent and using them). Add the rabbit to the marinade and allow to marinate overnight in the fridge. Remove the rabbit from the marinade and pat dry (reserve the marinade). Season generously with salt and pepper, and then brown in batches in the butter. Add the reserved marinade to the pot, stir in the sugar (or honey) and bring to a simmer. Simmer, covered, for about 45 minutes, or until the meat is tender. Remove the rabbit pieces from the pan. Strain the cooking liquid into a bowl. Discard the onion/garlic/etc, and return the cooking liquid to the pan. If you are making this in advance return the rabbit to the pan with the cooking liquid, allow to cool to room temperature and refrigerate overnight. Bring back up to a simmer for about 20 minutes to heat the meat through before proceeding (remove the rabbit to a serving dish while you continue). Whisk the flour with a little of the braising liquid to form a smooth paste. Whisk the paste into the simmering braising liquid and cook until it has thickened. Reduce the heat and stir in the cream. Season to taste. Ladle some of the gravy over the rabbit on the serving dish, and serve the rest of the gravy on the side. 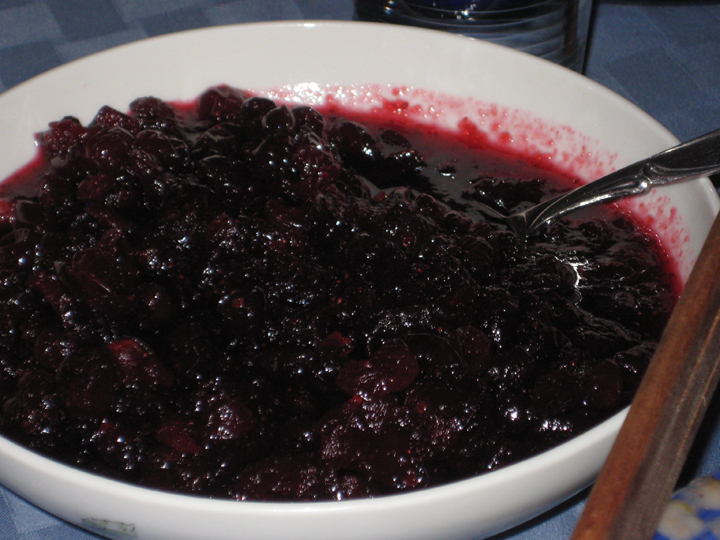 Pass the platter of rabbit & gravy with a bowl of the cranberry sauce (see below). * The original recipe called for a full ½ cup of flour which I thought would turn the nice gravy basically into glue. I’d start with a ¼ cup and add more flour as you thought was necessary to thicken your sauce. The original recipe has you make a basic boiled cranberry sauce – I substituted my standard roasted cranberry sauce, and brought it back up to a low simmer before I served it so it was warm instead of cold. Bring a large pot of water and 1 Tbsp butter to a boil. Add the potatoes and apples and cook until the potatoes are tender (about 20 minutes). Remove 1 cup of the cooking liquid and then drain the potatoes and apples. Return them to the pan, add 1 Tbsp butter and mash, adding as much of the reserved cooking liquid as you need to make a nice loose(ish) mash (I used maybe a ½ cup of the cooking liquid). Season to taste with salt/pepper. If you are feeling decadent (or have accidentally over salted your potatoes because the top fell off of your salt shaker) you can add a splash of buttermilk. 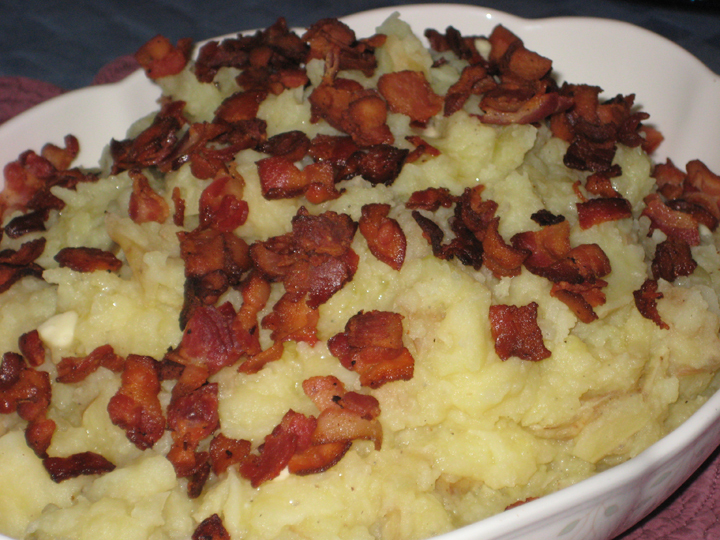 Serve with the remaining 1 Tbsp butter dotted over the top, and scattered with the crispy bacon pieces. Brussels Sprouts are a fairly traditional Dutch vegetable dish, although my mother refutes the idea that your traditional Dutch housewife would have done anything as exotic as roasting them, much less with balsamic vinegar and honey. She’s probably right, but there’s authenticity and then there’s boiled Brussels Sprouts and my quest for legitimacy only extends so far. 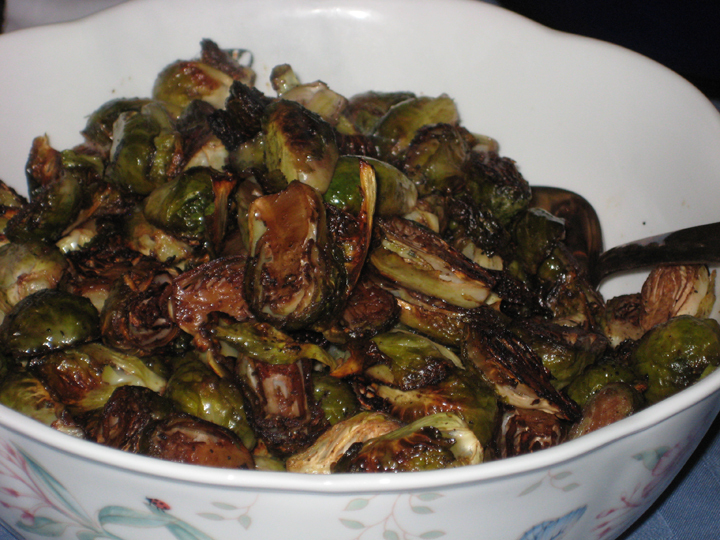 Enough Brussels sprouts to feed as many people as needed (about ½ lb per person give or take). Drizzle of olive oil. Drizzle of balsamic vinegar. Drizzle of honey or maple syrup. Salt/pepper. Roast at 375/400 for 25-30 minutes until crispy and cooked through, tossing once. As I said above, I’m unclear as to gender properties of the raisins and apricots. Are raisins and cinnamon more masculine or feminine? Is the shape of the apricot suggestive of the feminine? I arbitrarily decided that raisins + cinnamon = lads, and apricots + lemon peel = lasses, but I don’t think it makes much difference either way. Bring ½ cup water, ¼ cup sugar, and the cinnamon stick to a boil in a small saucepan. Stir until the sugar is dissolved. Add the raisins and simmer for 10 minutes. Cool and refrigerate for 48 hours. Add 1 cup brandy. Marinate for 4-6 weeks. Bring ½ cup water, ¼ cup sugar, and the lemon peel to a boil in a small saucepan. Stir until the sugar is dissolved. Add the dried apricots and simmer for 10 minutes. Cool and refrigerate for 48 hours. Add 1 cup brandy. Marinate for 4-6 weeks. Serve with a drizzle of heavy cream, or spooned over very good vanilla ice cream. This is absolutely brilliant, historically as well as culinarily. Can’t wait for King William to abdicate and the investiture of the then new Queen to justify a repeat of the above repast. Bravo and Leve de Koning. I enjoyed very much reading your coronation menu plus accompanying background comments. It brings back happy childhood memories. You did put an enormous amount of work into this. Unfortunately, Tante Carla and I had already booked a holiday trip in Portugal, which we could not cancel and, therefore, missed the big day. The Dutch are very pleased with their new king. Unlike your father, I would like to say”Lonmg may he reign over us”. I enjoyed delving into the mysteries of Dutch cuisine, and accessing a little bit of my cultural heritage. Although I have to say, the inflatable crown that Oom Ruud sent stole the show.